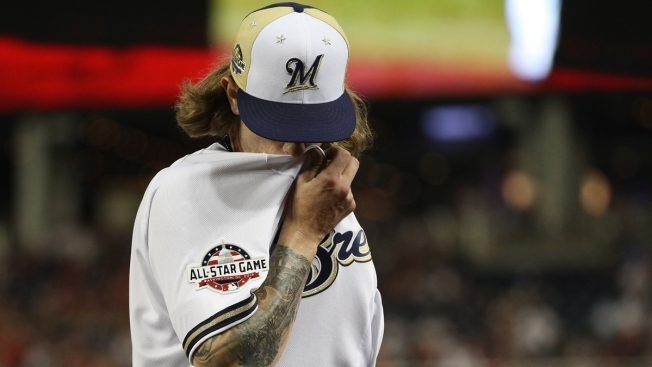 "I still feel that he's an amazing pitcher, but the things he said were inexcusable"
In this July 17, 2018, photo, Josh Hader of the Milwaukee Brewers reacts as he is pulled from the 89th MLB All-Star Game in the eighth inning against the American League at Nationals Park in Washington, D.C. During the game, racist, sexist and homophobic tweets he'd sent years before went viral. A pair of Twitter users whose posts exposing offensive tweets by baseball players went viral over the weekend say their aim was not malicious but to give fans a fuller picture of who they're cheering for, and to expose the sport's "toxic" culture. In exclusive interviews with The Associated Press, both users said they weren't looking for the years-old tweets from Milwaukee Brewers reliever Josh Hader or Atlanta Braves pitcher Sean Newcomb, but when the posts came across their timelines, they felt obligated to share them. Kevin Jenkins wasn't looking through Hader's twitter feed as he watched the All-Star Game earlier this month. But then they began popping up on his Twitter feed. After seeing the pitcher's racist, sexist and homophobic remarks, it was hard for Jenkins to remain a fan. "Before the tweets, I thought he was a cool guy," Jenkins said via direct message on Twitter. "An amazing pitcher and an even better person ... After the tweets, I mean ... It's hard to defend the guy. My opinion has definitely changed." Jenkins compiled screenshots of a handful of Hader's offensive tweets and created a post. That tweet has garnered nearly 6,000 likes. He said his intent wasn't to dig up Hader's past to bring him down. "I still feel that he's an amazing pitcher, but the things he said were inexcusable," Jenkins said. "None of us know if he's really changed since then. I felt it was important for people to see the tweets and make their own judgment." After Hader's tweets came to light, the reliever was swift to apologize, saying the posts were a youthful mistake, written in 2011 and 2012, when he was a 17-year-old and long before he was a major leaguer. For Jenkins, who is 16 and white, the explanation didn't fly. "I'm younger than he was at the time, and no one would ever see anything like that from me," Jenkins said. "It's horrid." Over the weekend, old, offensive tweets from Newcomb and Washington Nationals shortstop Trea Turner also resurfaced. Twitter user @NatsSquid posted about Newcomb after seeing one of the tweets on his timeline and did a search to see if there were others. "Baseball culture is toxic and I want players to be held accountable for what they say," said @NatsSquid, who spoke to The AP via direct message on Twitter and declined to give a reporter his name identifying himself only as "a DC-area male." "There is deeply rooted racism in baseball as well as homophobia and sexism," he said. "I would like baseball culture to change and be more accepting for everyone." Despite the rivalry between the Nationals and Braves — currently fighting for position in the National League East — @NatsSquid said his posts were not a form of fan warfare. "It absolutely had nothing to due (sic) with the Braves," he said. "When I tweeted out Newcomb's tweets, I didn't even remember that he played for the Braves. It wasn't about the game, or the team, it was about him as person. I was also really disappointed in the tweets that came out with Trea Turner and I thought I could expect better from him." @NatsSquid said he was aware of the Hader controversy when he tweeted about Newcomb. When asked if he thought this weekend's posts were the work of copycats, Jenkins said he hadn't considered it, but doesn't encourage it. "I'm hoping people don't continue to do this to athletes as a way to get attention, because that wasn't my intention at all," Jenkins said. The act of exposing tweets is recognition that racism is everybody's problem, said University of Hartford sociologist Woody Doane. "Going to a racist insult is something that white Americans have in their toolkit," Doane said. "As much as we like to say otherwise, I don't think that's something we've gotten rid of. If racism is going to end, white people need to call each other out on it. One of the elements of white privilege is not having to care about racism."